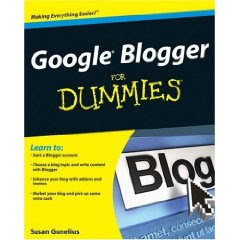 Some time ago, I was able to preview Susan Gunelius' new book, Google Blogger for Dummies, which is now available to buy from your local bookstore. After receiving my own copy, I've spent the past few weeks reading intently in order to provide you all with my full review of this "Dummies" guide. The "For Dummies" series of reference books published by Wiley are complete guides on a range of subjects which present information in plain English. "Dummies" books are offered as complete guides on the given subject, where the information presented makes the subject easy to understand even for a complete beginner. In Google Blogger for Dummies, Susan Gunelius offers a simple and comprehensive approach for understanding and making the most of the Google Blogger platform. Chapters range from "Setting up your blog" right through to "Making Money With Blogger" and "Boosting your Search Engine Ranking". This ensures that readers learn far more than how to use Blogger to publish our blogs: we can learn how to use Blogger to create an authoritative, income-generating and professional blog on the niche project of our choice. Google Blogger for Dummies is split into six main parts, with each part containing several chapters which comprehensively detail an aspect of blogging with Blogger. Furthermore, each chapter is segmented further into mini-sections (usually no more than a page long) which offers detail, advice and information on the aspects of blogging you may encounter. This section offers a complete overview of Blogger and blogging in general, which is especially useful for those who are creating a blog for the first time. By covering in brief the aspects of using Blogger which are detailed more fully in later chapters, Susan creates an excitement about choosing Blogger and anticipation of Blogger's effectiveness as a powerful blogging tool. In this section, we are presented with detailed instructions for creating and maintaining a Blogger blog, including how to initially create a blog; how to manage archives; comments and backlinks; writing blog posts; enhancing the appearance with templates, and using gadgets/widgets in the layout. Each chapter is enhanced by screen-shots and useful tips to ensure we can easily follow the instructions and advice given. I especially enjoyed reading Susan's advice about choosing which subjects to write about, and issues of copyright/fair usage. Such considerations are often misunderstood (or even overlooked) by those who are new to blogging, and her expert advice shines light on what is otherwise a cloudy issue. As pointed out in Google Blogger for Dummies, many people choose to start a blog in order to earn money from it. By devoting an entire part of this book to the subject of making money, Susan understands the needs of many Blogger users (both newly initiated and seasoned bloggers) and offers information most relevant for those using the Google platform as their publishing tool. In this part, we can learn about the many different types of advertising we can add to our blogs to generate an income, including text links, paid posts, contextual ads, and of course Google Adsense. This section of the book offers practical, useful advice for growing the audience of our Blogger blogs which is presented and explained in a very "down to earth" manner. Most bloggers are concerned with growing their blog's audience and increasing their authority in search engine rankings. I'm often asked about this aspect of blogging by Blogger Buster readers, but since this is something I've learned through a combination of gradual experience and "trial and error", it is not something I am expressly confident in explaining. Susan's explanations are very clear and easy to understand. She explains the nature of relationship building for bloggers, how to network with other online writers and particularly how to optimize our blogs for search engine rankings. Advice to help track blog statistics, effective linking and keyword analysis are also included which I feel is a boon to new bloggers who may have little understanding of what these buzzwords mean. This section offers details for growing and downsizing our blogs. By "growing", Susan refers to adding team members, writing for other's team blogs and creating a new blog linked to our blogger profiles. "Downsizing" refers to the practise of deleting a blog we no longer wish to own. In this section, we can also find details of blogging with different media (such as email posts, video blogging and posting via a mobile phone). Custom domains and FTP blogging are also discussed for the benefit of those who prefer to associate their blogs with their own domain name. In all "Dummies" guides, the "Part of tens" is used at the end of the book to reference key points or resources appropriate for the particular subject of the book. The "Blogger problems" section was the one I found particularly useful as it covers problems which Blogger Buster readers have contacted me about with regularity. These issues are explained in detail, along with problem-solving solutions and ideas for prevention so these issues do not occur again. One of the reasons I am a fan of Dummies books in general is the overall presentation of these guides which enables readers to locate the information they require with ease and literally "dip in" at any stage to find useful tips or references. The front cover is bold and unmistakably part of the Dummies series with a bold yellow background. Key points of the book's content are presented on both the front and back covers, along with a brief biography of Susan Gunelius - a professional blogger in her own right with expert status in marketing and branding. A key aspect of presentation which I find useful in any technical guide is the use of headings and points to break up text, and appropriate hints relevant to the main content at key points. In this respect, Google Blogger for Dummies comes up trumps: the content is very well organised making it easy to follow; icons refer to tips, warnings and technical areas of the content, while highlighted text boxes enhance basic instructional sections with advice based on Susan's professional experience on a given subject. The contents section actually comes in two segments: the first offers a brief overview of the parts and chapters, while the second is a comprehensive guide to include all major sub-headings (the individual topics) which are covered in the guide. Near the end of the book is a comprehensive glossary which provides easy referral for key terms associated with both Blogger and blogging in general. Finally, a complete index offers a means of easily locating any terms or subjects with which we need particular guidance. Unfortunately the screen-shots in Google Blogger for Dummies are in black and white, rather than full colour. Having read other Dummies guides before, I had not expected colour images; however, colour in some sections (such as when discussing templates and layouts) would have been more beneficial for readers of this guide to offer a more complete analysis of the sections being discussed. So is it a complete guide to Blogger? Almost, but not quite. The range of subjects discussed is very comprehensive in Google Blogger for Dummies and Susan Gunelius' expertise in blogging offers a highly comprehensive guide for building and maintaining a successful blog. However, there are a few small areas which I feel could be further enhanced, particularly as many readers of this guide will have little or no experience using the Blogger platform. For example, in Chapter 16 when explaining how to purchase a domain from a third party, more information regarding changing the DNS settings would have been much appreciated. This aspect of using Blogger is often difficult to navigate, and while I understand that the process does differ between domain providers, an overview explaining key terms or a link to Blogger's help pages on this subject would lift the fog and enable new bloggers to manage this important aspect of Blogger much more easily. I'm also concerned that the subject of editing the Blogger template is virtually skimmed over in this guide. Although the Layout>Edit HTML tab is briefly mentioned as a menu item and is referred to in the process of uploading third party templates, no explanation of how to manually edit the Blogger template is given. This may be a personal opinion, since editing templates is a key aspect of my experience with using Blogger; however, I'm sure that many readers of this book would have appreciated at least some advice, if only an overview of how Blogger template files are coded combined with HTML/CSS resources where more could be gleaned on this complicated subject. After having read most of the books available about the Google Blogger platform, I can honestly attest that Google Blogger for Dummies is the best and most comprehensive guide available. Rather than simply explain how to use Blogger, this book offers a complete guide to building a successful blog with Blogger, an interesting and wholly useful standard which few other books about blogging platforms have adopted. I do certainly recommend Google Blogger for Dummies, particularly for those who are new to blogging or who have recently decided to use Blogger as their publishing platform. While certain advanced aspects of working with Blogger could be enhanced, the basics are all included, enabling even a complete novice to build, manage and maintain their blog using this easy to follow guide. Google Blogger for Dummies is currently available from Amazon, Barnes and Noble and other online bookstores for around $16.49. Blogger wants to hear from us! One of the primary factors that drive innovation and improvements on Blogger is the voice of our users. We always take your feedback to heart, and we use it do help make Blogger the best service it can possibly be. We can log in to Product Ideas for Blogger using our Google account, then vote on existing suggestions by clicking the tick (vote up) or cross (vote down). When you choose a category (features, gadgets or Blogs of Note) you will be presented with a question you have not yet voted on, followed by the most popular suggestions. It's also possible to view the ideas suggested by a particular user by clicking on the name below each suggestion (take a look at mine here). I'm really excited about this new feature, and think it is the perfect way for the Blogger team to see the features (and recommended blogs) which are most desired by the Blogger community. While we have previously been able to suggest a new feature and suggest blogs of note, these forms gave us no indication of how popular these suggestions were. This forum enables us to see what others have suggested, how popular these suggestions are, and also to vote these up or down depending on our own preferences. Take a look at Product Ideas for Blogger to vote on your favourite suggestions and make a few of your own. Although I have set up many custom domains to use with Blogger, until this weekend I had never experienced this issue for myself (and was unable to offer any definitive solution for those experiencing this problem). My friend was experiencing this very problem after setting up her new blog a few days ago. We have been able to find some solutions which I hope may help others who see this error message when attempting to set up their custom domain. In order to make your blog accessible while troubleshooting your custom domain, it is advisable to publish back to your Blog*Spot domain for the time being. To do this, simply go to Settings>Publishing and click the link to publish your blog to "blogspot.com". Once this setting is changed, your blog will be accessible at your-blogspot-address.blogspot.com until the custom domain issue is resolved. Adding (or editing) the CNAME for your domain is the most complex and problematic issue when publishing to a custom domain. Those who have purchased a custom domain through Blogger/Google (usually through the Blogger dashboard) will find their DNS settings were automatically configured when the domain was purchased. If you purchased your domain name through a different vendor (ie: directly from the domain provider) you would have had to set up the CNAME setting for yourself. Most people want to link their entire domain (eg: www.mydomain.com) to their Blogger blog. In this case, you need to look for the CNAME for the WWW prefix and ensure this points to ghs.google.com (the correct setting). If you notice that the entry for WWW points to an IP address (a series of numbers), this setting is incorrect and should be changed to ghs.google.com instead. Those who wish to point their blog to a subdomain (eg: blog.mydomain.com), you will need to add/edit the CNAME for your subdomain (in this example, this would be "blog"). Ensure the CNAME entry for your subdomain points to ghs.google.com or change it so that it does. Important: you should not attempt to use a naked domain (eg: mydomain.com) when setting up your Blogger custom domain or you will experience issues! Be sure to use "WWW" or a subdomain and set up the CNAME accordingly. Once your domain is properly set up, you can choose to redirect the root domain (mydomain.com) to your blog's home page as I will explain later. Save any changes you have made in your domain dashboard and wait an hour or two for any changes to take effect. If you made any changes to the DNS settings, wait a few hours before attempting step 3. By "pinging" the domain you want to associate with your blog, you can check to be sure the settings have been configured correctly. If you use a different operating system, find out how to access the command line utility instead, or visit KLOTH.net to use the online pinging service. If your using the KLOTH service, you simply need to input the URL of your domain. Notice how it says "Pinging ghs.1.google.com? If you see something similar for your own domain, this means it has been set up correctly. The DNS settings have not yet taken effect. Wait a few more hours and try again (it can take as long as 48 hours for settings to propogate, though most become ready within 24 hours). If you have waited longer than 48 hours and pinging your domain still does not resolve to ghs.google.com, it is likely that your CNAME is set up incorrectly, in which case you should go back to Step 2 and check again. By now, your domain's CNAME settings should be in order, so it's time to try linking your blog to your domain once more. Go to the Settings>Publishing tab of your Blogger dashboard and click the "Switch to: Custom Domain" link. Since you have already purchased your domain, you now need to switch to the Advanced Settings page by clicking the appropriate link. Remember to use either www.yourdomain.com or the subdomain (eg: blog.yourdomain.com). Do not simply type yourdomain.com! It is also very important to type your URL in lowercase letters! If you use a combination of upper and lowercase letters (eg: www.MyDomain.com), this will cause problems for your custom domain. Once set up correctly, you will be able to access your blog through the custom domain even when typing upper and lowercase URLs in your browser. Check www.BloggerBuster.com to see this for yourself. If you are able to save this correctly and can access your blog at your custom domain URL, congratulations you are all set up and ready to go! But if you are still receiving the "Another blog is already hosted at this address" issue, continue to step 5. Because so many people have experienced issues with the "Another blog is already hosted..." message, the Blogger team have set up a form which you can use to resolve this issue. The reason I included all other steps before this one is because this service will only work if the CNAME settings for your domain are correctly set up and verified. You should only fill in this form when you are sure the CNAME settings are correct. You can access the Magical Custom Domain Form here, and read more about it on this page of the Blogger Help Group. This form works by clearing any Google associations with the URL you are attempting to use for your blog (which seems to cause the "Another blog is already hosted" issue). Within 48 hours (possibly less), your URL will be cleared and ready to use for your Blogger Custom domain. After checking all other settings, my friend filled in the Magical Form and found her custom domain issue resolved in about a day. As I mentioned earlier, you need to use www.mydomain.com or [subdomain].myblog.com when setting up your custom domain. You cannot set up the domain effectively using the root URL of your domain (eg: http://mydomain.com). Those who have purchased their domain name through Blogger should be able to redirect their non-www domain to their blog with ease. Simply check the setting on the Settings>Publishing page which says "Redirect yourdomain.com to www.yourdomain.com and save. If you purchased your domain from a different vendor, checking this setting will probably not work. In other words, yourdomain.com will not redirect to www.yourdomain.com even when this setting is checked. For Blogger Buster, I created a "meta-redirect" page which is hosted with my domain provider, GoDaddy. You can read how I set up this redirect page here. For a different domain, I set up a 301 redirect using .HTACCESS. This requires Linux hosting to be available at the root domain (check here for instructions for free basic hosting if using GoDaddy as your domain provider). Setting up an .htaccess file is not particularly easy, but if you're interested, take a look at this in-depth article from Taming the Beast (in particular, the section for "www vs non-www). Another possibility is to forward your non-www domain to your www domain using the forwrding settings in your domain dashboard. Ettiene has written a tutorial for this which may be useful for those wishing to try this possibility. Although I have never used this method for my own blogs, I'm assured by others that this works to redirect the non-www domain to the www domain of your blog address. I hope the methods outlined in this article have helped resolve any issues you are experiencing with your Blogger custom domain. Please let me know your thoughts and opinions, particularly if you have advice on other methods which could work to prevent the dreaded "Another blog is already hosted" message, by leaving your comments below. Have you noticed the new "Monetize" tab at the top of your Blogger dashboard? This new section of our Blogger dashboards makes it easier than ever to integrate Google Adsense in our blogs and see just how much our blogs are earning. Google's Adsense program is a simple solution which many Bloggers use to monetize their sites. For some time now, Blogger have made it easy for us to include Adsense ads in the sidebar (as a page element) and around blog posts (as an option in the Layout>Page Elements section, when you click the "Edit" link for your blog posts). On this page, there are also links to view your Adsense Payment History, earnings reports and to switch the account associated with this particular blog. You can also choose to "remove ads" from all aspects of your Blogger layout at the click of a button. For those of you yet to add Adsense to your layout, simply choose one of the ad-layout options most suitable for your needs anc click the "Next" button. You may be required to set up an Adsense account (or associate an existing account with your Blogger profile), after which your ads will be immediately placed in your layout. Then when you visit the Monetize tab, you will be able to see details of your Adsense earnings for the ads you have placed in your layout. Although Blogger have made it very easy for members to add Adsense to their blogs, not every applicant will be successful in getting their own Adsense account. Adsense reviews all applicants to the program before agreeing to (or denying) a new account. In order to apply for an Adsense account, you must be over 18 years old and have a website which complies with Adsense policies. If you post any questionable content on your site, you really should check these policies to ensure your site complies before submitting your application. Also, the reports displayed on the Monetize tab will only show page views and earnings from the time that you connected your Adsense account with this blog. If you have previously linked your Adsense account with your Blogger profile, it seems the "All Time" earnings will display earnings from today onwards (one of my blogs uses an Adsense Page Element, but is only displaying earnings from today). If you log into your Adsense account, you will notice a new channel has been set up for each of your blogs, which contains the URL of your blog in the title. The information from this channel is what's used to present the earnings data for the Monetize section of each blog you write. I am very happy to see that the Blogger team have put such effort towards integrating all of the Google services we Bloggers currently use. However, I am a little disappointed at some aspects of this new feature. For my own blogs, I have added Adsense manually, by editing the Blogger template and inserting ad codes where I would like them to be displayed. For this reason, I am unable to see any reports on the Monetize tab. In fact, it appears as though I have not set Adsense up at all. Also, the earnings displayed on the Monetize page will only include the earnings for this particular blog, not your total earnings from any different sites operated. However, these are small issues, and perhaps these issues will not affect most other Blogger users. 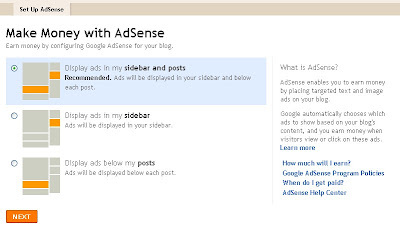 Will this new "Monetize" dashboard feature make it easier for you to connect your Adsense account with your blogs? How well do you think this feature performs so far?